We have FBs, two of them. What should we do? It is a really odd bug... apparently they have a tendency to get right up to the fortification, then dodge, which can include dodging into the fortification, and then out into open air. So that entire rampart was a marksdwarf slaughtering ledge. Just wrapped up siege two. With improved ramparts. And we STILL lost a marksdwarf. But this time it was an iron bolt to the spine, so at least there is that. 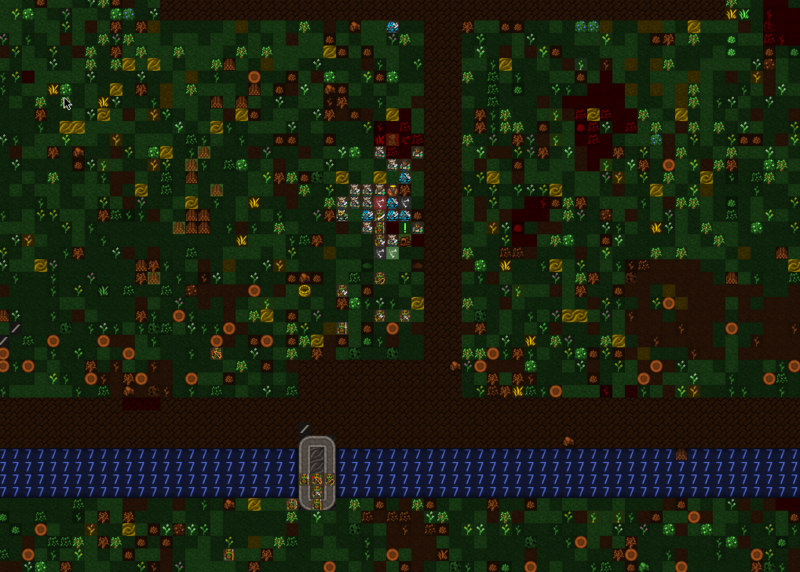 I am seriously considering paving the entire island, building a bailey wall, and then just funneling the goblins in. A note states that Grimmash was unable to write any updates at the beginning of the year as she had entered a potentially severe depression. Ignore that scrap, a bunch of nonsense, I just had a bit of a moment there. Asked to be taken out of the rotation on training for a bit as the memory of all those goblins got to me a bit. I’m going to work on some wood crafting for a bit, see if that clears my head up. Due to a mishap with war dogs and pastures and pens, our assault on Ropefly didn’t leave until the beginning of the year. Apparently everyone was waiting around a few miles away until a few dogs showed up. Anyhow, they left as soon as the dogs arrived and then came back! 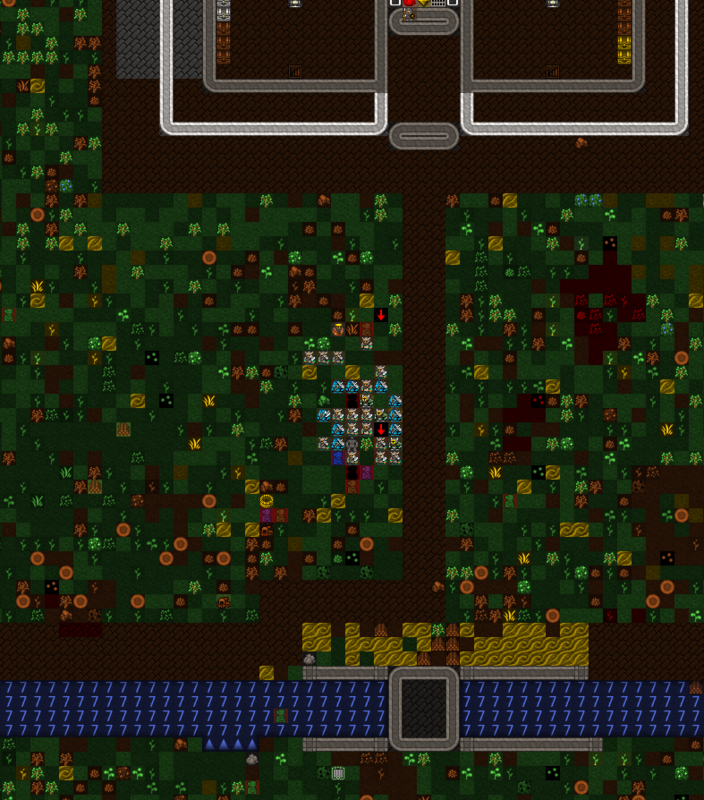 And waiting for the dogs was a bad idea, as two of the pups died to goblins. 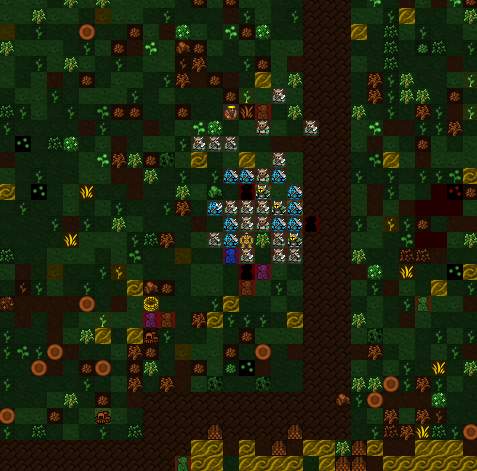 The dwarves fared better however, killing at least four goblins. The spoils were underwhelming. I was also informed that Lord Lemon is also now officially the Baron of Earthden, which appears to be far to the north. Time to start digging out his new rooms I suppose. Guy goes off and kills a few goblins, suddenly he’s a Baron? I’ve been here since the start. I founded this place! Unfortunately, Grimmash killed another dorf, Zuglar Akrulelbel. It is with heavy hearts that we have decided to send her into the hills, to try and slay as many goblins as she can before she falls. She is being sent to Hardylie, a goblin encampment, to raid and pillage. Looking back over this journal, seems like Grimmy was getting pretty dour. I’ll try to brighten things up from here on out. My name is Smoots Sarveshgidthur! More bad news for Grimmash, she killed Dakost Etesututh as well on her way up through the fort. Struck Dakost down in his room. After we kept herding her to the supplies, she finally left. Hopefully she can find some peace killing goblins in Hardylie. Armok knows she took out enough of her own the last few months! After review, it looks like our Broker Bembul may have actually killed Dakost. Bembul will be sent to raid as well, targeting Strapsmaligned. 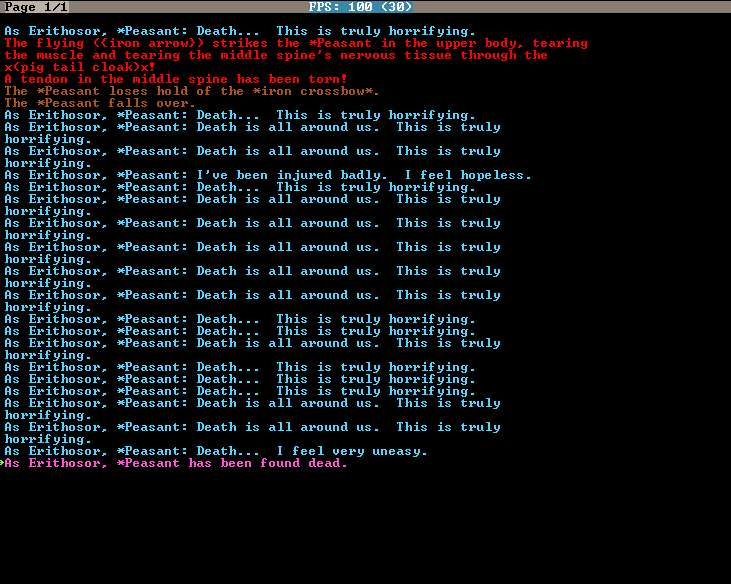 You just cannot please some dwarves. So aside from the terse writing, grumpy demeanor, and generally homicidal tendencies towards the end, Grimmash really had her head screwed on when it came to defensive constructions. We went through her belongings and found plans for the archer towers, and a full wall with a bailey. We’ve decided to honor Grimmash as we prefer to remember her, and continue the fortifications. We tested out the new double fortifications on the central tower. They worked admirably, and while no one dodged out through the fortifications, a stray arrow did manage to hit poor As Erithosor in the spine. As perished shortly after. We baptized the future site of our bailey with the blood of the goblin attackers and took very minor wounds amongst the melee squads. 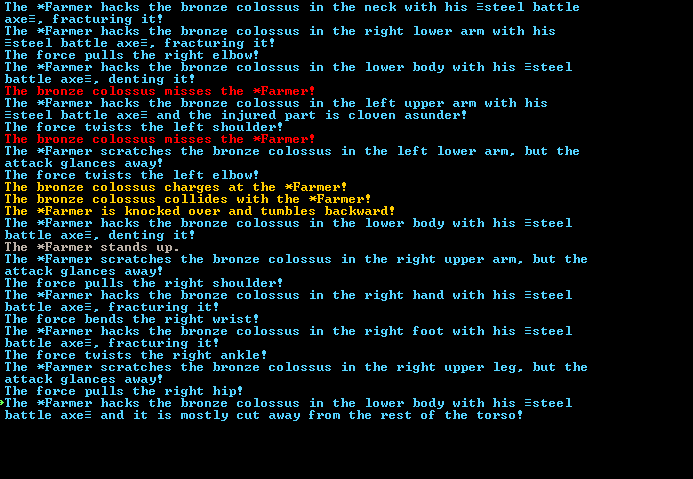 A bronze Colossus, Seinelare Dagiemepe has come. We shall try to defeat the beast. The battle raged across the main road into the night and through until dawn. 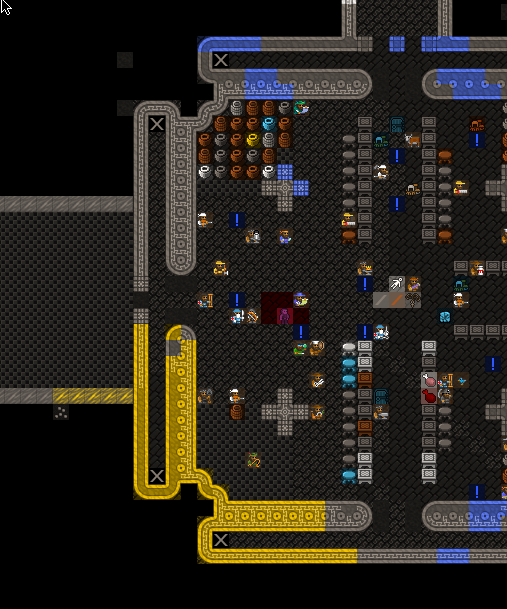 Our hammer dwarves battered it with their silver war hammers to little effect. Eventually AllegedOne had the bright idea to use the steel battle axes assigned to his squad, and rapidly hacked apart the colossus. In the midst of the fighting, Kosoth Ingizgemsit caught an unlucky blow to the head, which ended the dwarf’s life almost instantly. After the dust and blood cleared, the colossus had transformed into statue of a honeybadger man. Very odd. We decided to place it in the throne room. Wel, we had quite a summer between the siege, the colossus, and a lot of building. We completed some major work on the Island, adding an entire perimeter wall per the designs Grimmash left behind, and we finished the main bailey. The North and East bridges have been completely dismantled now, leaving only one entrance to the fortress. At this point neither Grimmash nor Bembum have returned from their raids, and we are beginning to fear that their trial by ordeal may have found poor judgment in the eyes of the gods. We are going to send the Second Axes and Hammers to raid again. We will send them to Hardylie to see what ever became of Grimmash. 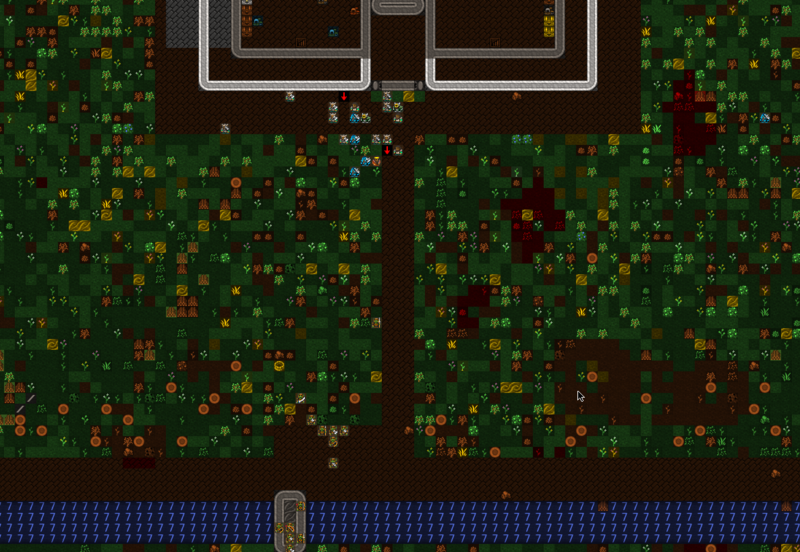 Winter has come, and no caravan from our dwarven brethren has come to visit us… most strange. I know we host the queen now, our very own Siggy. I am so proud of her, and she even is keeping her mandates rather simple and useful. Mostly she asks for quivers now and then. Perhaps her time as the Chief Medic and all the injuries the marksdwarves took in our first siege left and impression. In an effort to clear out a the absolutely mind boggling amount of stone we have, and clear out the ungodly mess down there, we have started walling up the shallowest cavern layer. The basic plan is to build walls with a bridge on each cavern opening, and then work through the piles of webs and trees and such down there. 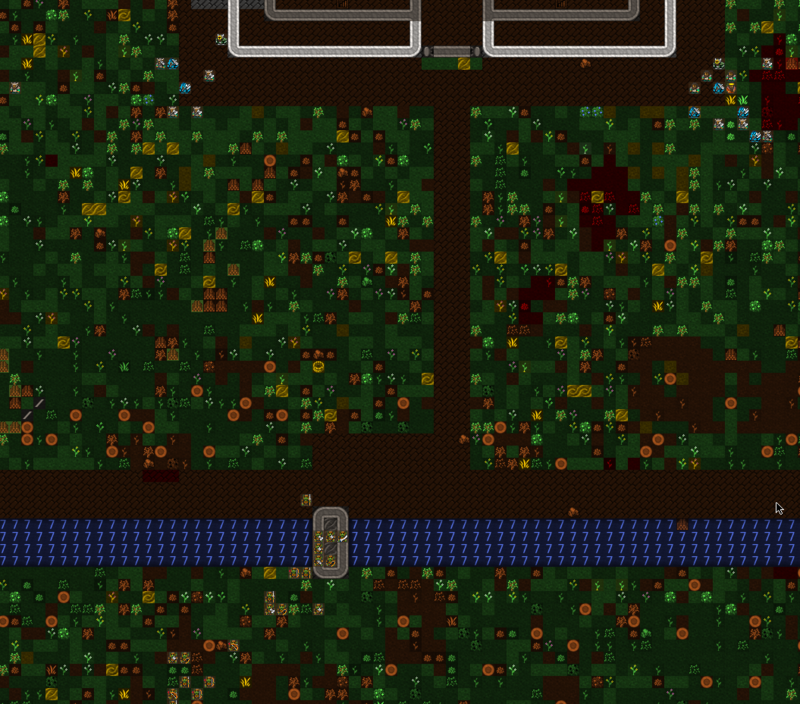 We might even be able to use the doors to catch something useful amongst the random beasties that wander in. Finally, we finished up construction on the second library, one for foreigners to come visit. Hopefully that will kickstart our reserachers into actually writing something. A lot of us are starting to get very bored after five years without a damn book to read or scroll to glance through. Our first Human Scholar, Gisu Gelomluki has come to visit the new library. What a happy day! We have almost finished walling in the cavern. It is a tremendous amount of work, building scaffolds then walls, then tearing them down. But we are ever so close to having a safe space below ground to house livestock and stretch our legs without fear of the sun. No raids have yet returned, which is rather troubling. Lord Lemon and Arnie are with them, so I really hope we hear some word soon. Seeing this new raiding mechanic for the first time is so cool, adds a lot of mystery and adventure to DF. Hopefully you haven't sent them all into a dwarf blender. 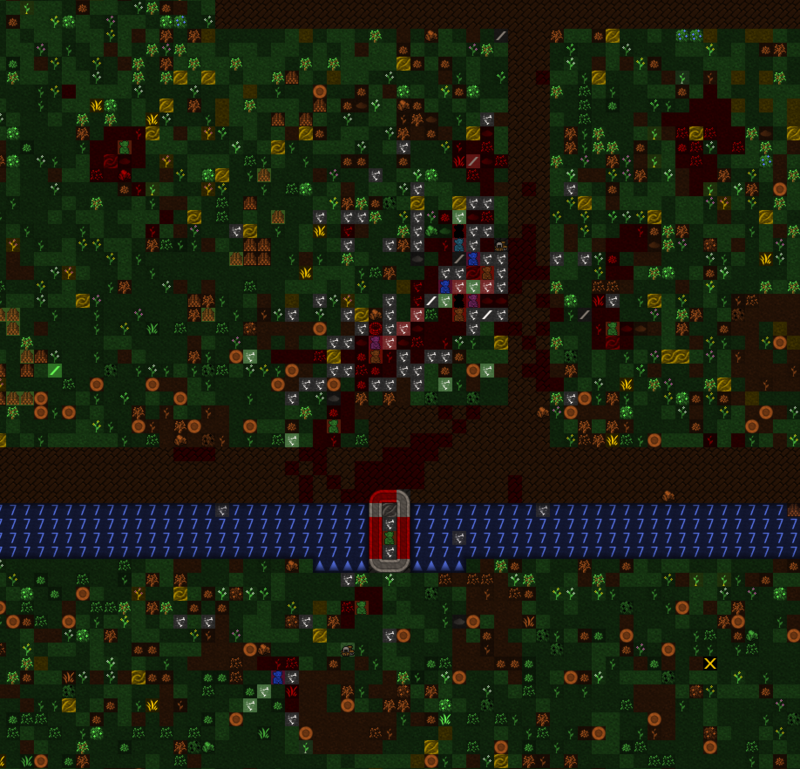 To be honest, I am a bit worried I sent them into a nest of bugs. I have been backing up the seasonal save, and if we get past about two years, I may just abandon and reclaim to avoid the bug where the game crashes after squads return. 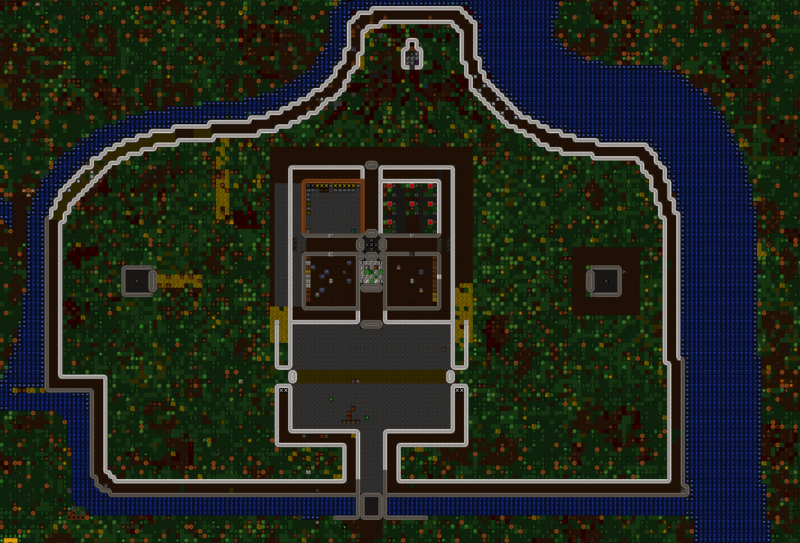 The fort itself is in a great place, I'd rather no re-do all the building work. I am fairly certain Grimm and Bembul died or were captured, as the squads they were in are empty. However the other two squads are "locked" in to the mission and have been gone for some time, far longer than a few days travel. If they do come back dead or with significant losses, I would consider that a win at this point. 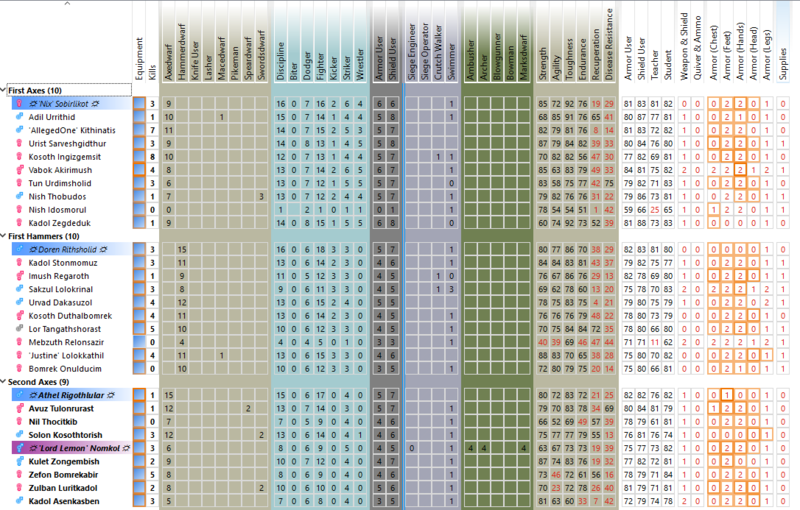 Also on the docket: Potentially killing off all pets as pets seem to really screw with missions and squads. Sending out squads to try to colonize other areas. I have been moving on this, but the squads are still missing. I'm probably going to try to run this thing out for another year or two in game to see if the squads ever come back. Since the whole point of this fort was to make it about, for lack of a better phrase, conquering the world, I'll give the squads three in-game years to come back. If they don't, I am not really interested in continuing this particular playthrough. It is taking time as the FPS is pretty low. I am trying to solve it, but when the game crawls at 15 FPS it takes time.